On this date in 1883,* Albuquerque hanged its Town Marshal. Milton Yarberry was one of those belt-notching Wild West gunmen badass enough to be worth deputizing for a frontier town with a spiraling crime problem — which Albuquerque was experiencing as the just-completed railroad boomed its population. A number of crimes had been attributed to him in a career that took him from stage-robbing in his native Arkansas, to the Texas Rangers, to a Colorado saloon, to a New Mexico cathouse, a veritable bucket list of spaghetti western tropes packed into 34 roughhewn years with bodies planted at nigh every stop. Yarberry was even reputed to have fought alongside Billy the Kid. The last of these tropes, of course, was as the bad hombre upon whom the townspeople foist a badge. It will not surprise that even when minted as a peace officer, Marshal Yarberry continued his manslaying ways. Still, nobody in our present age of impunity could well imagine a lawman standing trial for murder twice in the space of a year. Yarberry in early 1882 defeated a charge for wasting his lover’s paramour during a row in the street, as witnesses said Harry Brown shot first, just like Greedo. There was no administrative leave or counseling after that, just straight back on the beat — and barely a month later, the copper gunned down a guy whom he was trying to stop for questioning. It was a confusing encounter in which the Marshal insisted that he fired when the victim, Charles Campbell, wheeled on him with a gun. A single state’s witness was able to establish in the court’s mind that there was no gun in Campbell’s possession. Our hard-living triggerman would never waver from his self-defense story as his appeals were made;** he had many supporters who believed that he was being railroaded on account of the public relations hit the city was taking for employing a dude who had so liberally populated the Republic’s Boot Hills — and those advocates included the sheriff who recruited Yarberry as a Marshal, Perfecto Armijo, who was also the sheriff detailed to hang Yarberry in the end. The local Albuquerque podcast City on the Edge has an episode dedicated to Yarberry here. 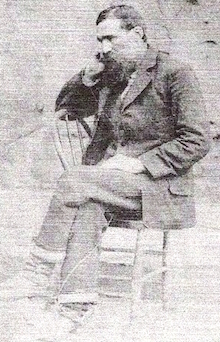 * In the anarchic game of telephone that was 19th century reporting, some editor somewhere mistakenly understood a story of Yarberry’s condemnation in 1882 as an actual report of his execution; as a result, there were news stories (themselves repeated by multiple papers) announcing Yarberry’s hanging in June 1882. In this business, once one wrong date is out there it’s bound to be echoed into eternity, so it’s still possible to find sources that misdate the execution to June 16, 1882. Past the question of the calendar, the fact that these stories actually expanded with details about the fictitious hanging scene strongly underscores the degree to which the hang-day bulletin had become colorfully but generically abstracted from any save accidental relationship to the actual scene at the gallows. Cincinnati Daily Gazette, June 17, 1882, vividly peopling an imaginary scene. ** Because New Mexico was still just a territory — it was only admitted to the Union as a state in 1912 — Yarberry’s clemency decision went to the U.S. President, Chester A. Arthur.